Harrington Sound is a large inland sea five miles (8km) northeast of Hamilton. Its calm waters provide perfect sailing territory. The Sound is linked to the ocean by the narrow Flatts Inlet where changes to the tide are magnified and waters rush beneath a bridge connecting the two sides. On the north side of the inlet, opposite Flatts Village, is the Bermuda Aquarium where visitors can enjoy more than 100 species of indigenous Bermuda fish in ocean and reef environments. 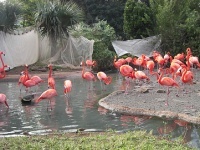 Located within the same complex is the Natural History Museum and zoo that features animals from the Caribbean, Australia, Asia, Madagascar and the Galapagos.